Bexley Citizens Advice Bureau is an independent charity committed to helping people overcome the problems they face. They do this through the delivery of free advice services and by campaigning to improve the policies and practices that affect people’s lives to make society fairer for everyone. Bexley Citizens Advice Bureau is a registered charity and a member of the National Association of Citizens Advice Bureau– the UK’s largest advice charity. Bexley Citizens Advice Bureau employs over 15 people and has in excess of 50 unpaid volunteers. Through the training, information systems and operational support provided by Citizens Advice are equipped to deliver the highest quality advice to residents in our local community. They provide free, independent, confidential and impartial advice to everyone on their rights and responsibilities. CAB advice helps people resolve their legal, money, debt, benefit, employment, housing, consumer, discrimination and other issues. Bexley CAB is able to support parents and carers of children and young people with DLA (Disability Living Allowance) and PIP (Personal Independence Payment) up to and including appeals. CAB advice guide has practical, reliable information to help you solve your problems 24/7. Also includes frequently asked questions in other languages. The information is continually reviewed by Citizens Advice’s team of advisers and covers the law in England, Northern Ireland, Scotland and Wales. If you would like advice by e-mail please complete the on-line form. It is their aim to answer your question within five working days. 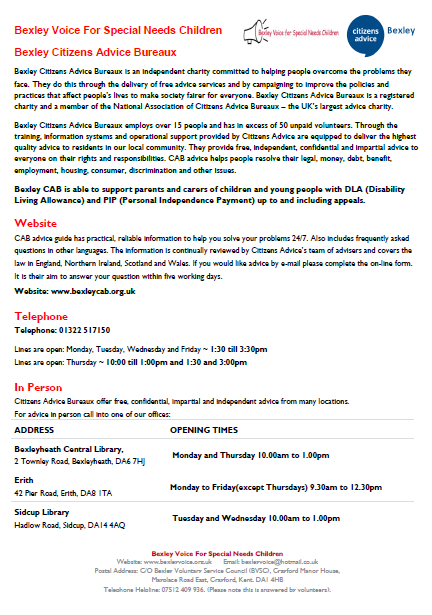 Citizens Advice Bureau offer free, confidential, impartial and independent advice from many locations.